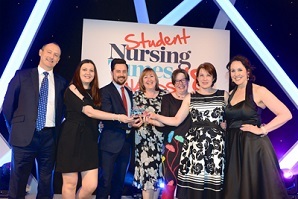 London South Bank University (LSBU) and St Mungo's – the homelessness charity - won Partnership of the Year at the Student Nursing Times Awards 2018 on Thursday 26 April, in a ceremony at the London Hilton Hotel in Park Lane. The University's partnership with St.Mungo's has been going since 2015 and involves LSBU nursing students being provided with one-week placements and a week elective placement by St Mungo's, each academic year. Annually, around 150 nursing students take part in the practice learning experience at the charity. Warren Turner, Dean of LSBU’s School of Health and Social Care, said: "I'm delighted we have won this award. It's a great success and shows the exceptional partnership that we have with St Mungo's. "Our nursing students work incredibly hard to show their initiative in challenging environments, administering medical treatment to the homeless while working in community outreach, substance abuse and specialist mental health teams, among others. We are proud of the partnership and the hard work they put in to win this award." The Nursing Times awards honour student nurses, universities and organisations from across the student nursing community in 19 categories, celebrating exceptional achievement. The partnership with LSBU offers many benefits for staff at St Mungo's, their clients and the nursing students. For a full list of the winners and more information about the event, see The Student Nursing Times Awards 2018.